Cream pie...with cupcakes! Everyone's a winner! When it comes to cream pies, you probably think along the lines of banana, coconut, or chocolate. But why limit yourself? Why not let your imagination fly high and fill your pie with delicious cupcakes? 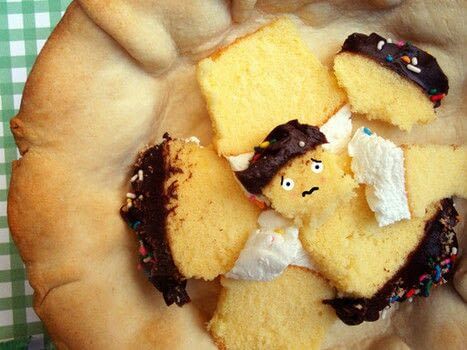 I recently gave this pie in the sky idea a try by lining the bottom of a baked pie crust with alternating slices of cut-up vanilla and chocolate frosted cupcakes, over which I poured a rich, homemade custard filling. So what happens? As the custard sets, it absorbs some of the rich butteriness of the frosting, infusing the entire pie. 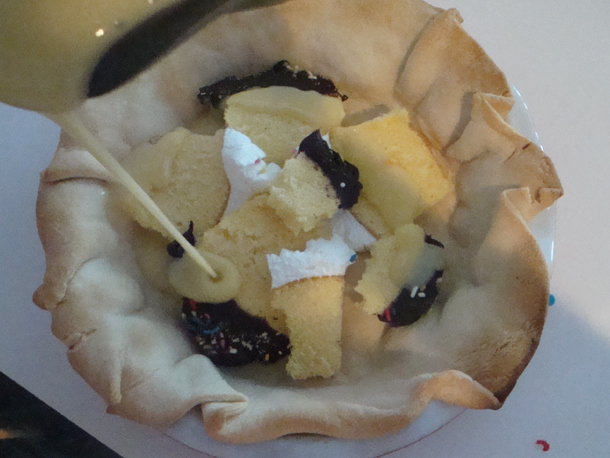 As a result, the taste is kind of like cream pie meets birthday cake, in a decidedly delicious way. While some might argue that it's gilding the lily, it might interest you to know that this pie also tastes fantastic when paired with ice cream. 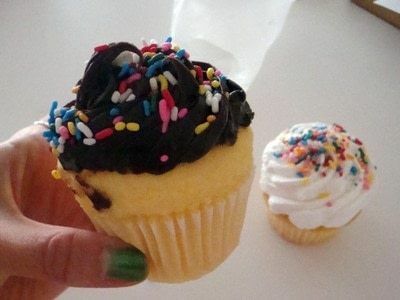 Slice the cupcakes into thin slivers, lengthwise, so that each slice has a little cake and frosting. Line the bottom of the baked pie crust with cake slivers. Try to cover the bottom of the pie evenly. In a medium saucepan, combine the milk, eggs, sugar, flour and salt and mix well. Bring to a boil over low heat, stirring constantly. Remove the pan from the heat, and stir in the vanilla extract. Beat the eggs lightly. Gradually stir 1 cup of the hot mixture into the yolks, and beat vigorously with a whisk (to ensure that you don't end up with scrambled eggs!). Return the egg mixture to the saucepan and bring the entire mixture to a low boil. Cook and stir for 2 minutes before removing from heat. The mixture will be rather thick, but still pourable. Pour the filling into the prepared crust in a smooth, steady stream on top of the cupcakes. If they shift slightly, that is OK; however, if any pieces float to the top, push them back under the custard. Put the pie in the refrigerator and let set for 4 hours before serving. If desired, serve with whipped cream and / or ice cream.